Somedays I feel like there is only part of me left, the other part of me having disappeared somewhere along the way during the past 12 years. People have asked me how I keep going on this journey with my son Brendan Bjorn. I usually don’t have an answer. I hesitate. I joke about it being coffee and chocolate that keeps me going. I then end up saying LOVE. It is love that keeps me going. 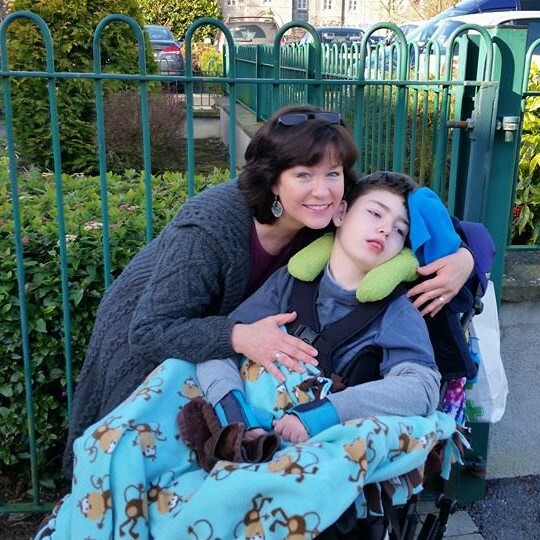 Somedays I feel like I can do anything and everything, energised with that love that keeps me going and able to single-handedly care for Brendan Bjorn and his brother Declan, and still have the energy to work for needed changes in the world of disability and carer rights. Again, it is love that keeps me going. Somedays, like today, I wonder about both the past and the future. Sitting here on a cold, wet Irish evening, with the sitting room fire going and Brendan in his wheelchair next to me, I take this quiet moment to reflect. What of the future? What of the dream to once again own a house and know that we won’t again be at the mercy of a landlord wanting to sell “our” home or raise the rent? What of the feeling of peace and contentment in knowing you are truly home – your own home – and this is IT? Once, in the past, I knew that content, peaceful feeling of owning my own home. Now, today, I doubt it will ever happen again because as a full time carer, I am embarrassingly relegated to attempting survival on meagre amounts of social welfare while working myself into exhaustion. And…my heart breaks at the thought of that dream, like so many others, being lost because the work I do is not valued by most in society. As I sit here this evening, I think of two of my ancestors who inspire me to continue working for the greater good. I like to think these two continue to guide me, energising me to fight the good fight and to not give up. One was Arne Fjellbu, my 1st cousin twice removed. A Lutheran priest in Norway, he was expelled for boldly speaking out against the Nazi regime there and for being part of the Norwegian Resistance. After the war, he returned to Norway, becoming Bishop of Trondheim, performing the consecration of King Olav V, and continuing for years to bring progressive reforms to the church. Another was my Grandfather’s grandfather, Turlington Walker Harvey, who was an inventor and businessman in Chicago, eventually working his way to becoming a multi-millionaire. But, it is what he did with his fortune that inspires me. When the great Chicago fire happened, he used his personal funds to help rebuild Chicago, at one point building 400 homes a day to aide the some 100,000 residents left homeless. Yes, they do indeed inspire me, just as my two beautiful sons inspire me. They are all part of me. And so, I feel a bit more empowered. A bit less hopeless. A bit more hopeful. There are dreams that are dying, like that of owning my own home again, but I will continue to work on finding new dreams. I think one must find new dreams to continue on this challenging journey with a disabled child who has a life-limiting illness. We must. Maybe, just maybe, there is more than only part of me that is left after all.